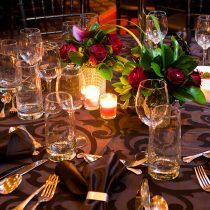 Eclectic Events International Inc. is built on the core fundamentals of excellence, price performance, integrity and our dedication to not only meeting, but exceeding, our client’s vision and expectations. We are a full-service, international award-winning event & conference design, management & production company working for well over a decade exclusively catering to leading corporations and associations nationwide. We customize every event and conference specifically to the objectives and budget of each client, winning awards time and again for our sophisticated and cutting-edge work. Our experience working with diverse clients and corporate cultures allows us to truly connect with and understand each unique corporation or association we work with. Long-term relationships built with our clients remain strong and new clients are growing with us. Many of our clients see us as an integral tool in their marketing, event and promotional programs. We take the time to learn about your company, what you do and who your attendees are to ensure the concepts we design are spot-on every time. We sincerely care about the work we produce and the clients that partner with us. We are committed to excellence, passion, integrity, all while raising the bar in our industry and adhering to ethical conduct. We are innovators, trend-setters and are always moving forward. Our client’s privacy is paramount and we always work to protect our client’s reputations, best interests and business philosophies. While we have an extensive list of Fortune 500 corporations we work with globally, we do not publish this list online. If you are a potential client and would like to know more about who our clients are, please contact us directly. We understand that you’re only as good as your last event… and after thousands of successful events, we are committed to upholding our impeccable reputation. We take the time to learn about your company, what you do and who your attendees are, to ensure the concepts we design are spot on every time.